Summertime is all about fun in the sun, but too much sun can leave you feeling pretty miserable. So what’s the best thing to do if you get a sunburn? Check out our list of at-home remedies to help protect your skin during the dog days of summer. If you’ve ever been stuck with a painful sunburn after spending the day at the pool or beach, you know you’ll try anything to get some relief. Turns out there are some great treatments you can do at home from the moment you feel the tingling beginnings to the blistering point of no return. 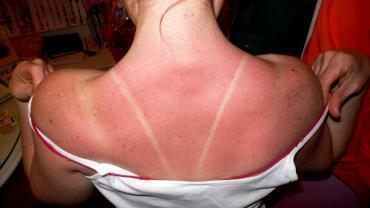 When you get a sunburn, your skin becomes inflamed. Cool it off with a cold compress or cold water. You can even sit in front of a fan for extra cooling sensation. Fat-free milk: Instead of using cold water, add in some milk for more relief. A ratio of one cup of milk to four cups of water will do. Use a compress for 15-20 minutes and repeat every two or four hours. Cornstarch: A cornstarch and water paste works wonders when applied directly to you skin. Yogurt: It may sound strange, but you can apply yogurt directly to skin, too.Then rinse it off in the shower. The ingredients in soap won’t help your sunburn, so avoid using it if possible. The best idea is to stick to cold baths or showers. If you must use soap, the milder the better. Don’t scrub your skin, either — that will just irritate it more. As you wash, clean, and compress, your skin may become dry. Use a mild lotion rich in Vitamin C and E to help rejuvenate the skin as it heals. One of the biggest signs of a serious sunburn is the emergence of blisters. These need to be treated with care. If the blisters only cover a small area, you can treat them at home or leave them alone to let your body heal on its own. The best remedy for sunburn is to prevent it. The American Academy of Dermatology recommends applying sunscreen — broad spectrum, SPF 30 or higher, water resistant — any time you are outside, year round. Wearing protective clothing helps, too. 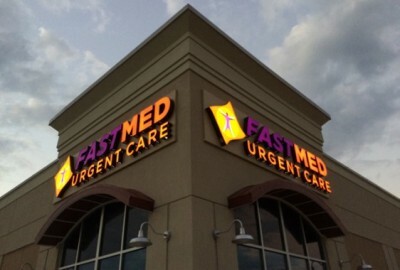 If you or someone you know is experiencing these symptoms along with the typical sunburn symptoms, visit a medical professional at your nearest FastMed Urgent Care. We accept most major insurance plans, including Medicare and Medicaid. We also offer extended hours seven days a week for your convenience. We’ll help you treat your sunburn and get you on your way!